-- No touch, no strength. BC was off all over the floor, but it was uncomfortable to watch them miss so many shots close to the basket. The bigs couldn't do it. The guards missed plenty too. I would blame Clemson's D, but too often it was just our guys missing. We desperately need a guy who can just go up and either slam it home or draw a foul. -- I think I overrated Hanlan. Changing offenses certainly hurt his numbers this year as does playing more point. But maybe Hanlan is just very good but not great. He was fine Saturday, but BC needed him to step up early. He didn't. They also needed him to drive more. It didn't happen -- in part to how Clemson was defending him. -- The team misses Clifford. He still not 100% and that left Carney playing long minutes. We could have used him on the boards and if he had been healthy, he might have finished some of those shots in the paint. BC scheduled Howard because that is what Brad Bates and Steve Addazio want. One could point the finger at the ACC's flip-flop on conference games, the ripple effect of Army cancelling a few years ago, the ripple effect of Syracuse becoming a conference game, or the ripple effect of New Mexico State rejoining a conference. It doesn't matter. BC's leaders surveyed all their options and this one made the most sense. New Mexico State's return date has been on the schedule for a while. However, no one ever really thought it would happen. Once the Aggies rejoined a conference they were left with too many non-conference games. Of their potential games, BC remained their least lucrative and therefore most likely to be cancelled. Brad Bates knew that. BC had time to find a replacement. But none of the solutions made sense. Scheduling one for ones out of the conference isn't that difficult for BC. We are a respectable, but not threatening opponent with a good TV partner in a desirable destination. If Bates calls most programs they will consider future opportunities. The challenge this go-around was finding one who was willing to come to Alumni in 2015. Every team has its price. BC could have paid some team to come to Alumni for a one off. The problem is that it would have been very expensive. Even with the money from the New Mexico State penalty, it would have been hard for BC to pay SEC dollars to a visitor. We just don't have the ticket revenue. I am sure there were a few eager teams willing to come to BC to beef up their own resume without a blockbuster payday. However, I don't think Addazio wanted test the team like that. So BC ended up with Howard: a team willing to come to BC at BC's price. The obvious downsides -- outside of losing -- is a disappointed fan base and not getting enough wins for bowl qualification. But the demand for tickets seems to be pretty inelastic. Even with USC and Clemson on the schedule, we didn't sell out Alumni. If we replaced Howard with an Alabama, would Alumni sell out? Would our season tickets packages skyrocket? Probably not. It is going to take a series of things -- including winning -- to improve attendance. The bowl issue could be troublesome but I think BC can politic out of that issue too. If we go 6-6, I think we will still go bowling. There are just so many slots and ESPN remains in our corner. What NCAA team is going to protest if a 6-6 BC team goes to some bottom tier bowl? Playing two FCS teams is not ideal, but I don't think it will be the norm. BC has scheduling issues ahead, but I think Bates and Addazio will navigate those issues as they try to build a winner. Christian says Clifford still isn't 100 percent but Magarity would've started anyway because of how well he's playing. One week until NSD. Rest assured that your HC will sign a class that "fits all of our needs" and has him "very excited about the future." The ACC and BC finally released their 2015 schedule. The only real news on BC's front is that New Mexico State is officially out and replaced by...Howard. This is not a good schedule. It doesn't line up well. It doesn't help sell tickets. The only thing it does well is set BC up for a true transition. We are breaking in a new, young QB and a new play caller. The team will be fairly young. This soft schedule enables them to bottom out, yet still keep up momentum and still continue winning. BC will play seven home games and a game at Fenway. That leaves only four true road games. And the first road test doesn't even come until October. BC wasn't great at home this past year, but that doesn't mean playing at Alumni is not always preferred. As the roster matures, the home-road will be less of an issue, but for now it is a good thing. Brad Bates is going to take heat for scheduling this game, but it is not all his fault. Addazio wanted a light schedule too. When New Mexico State bailed on their return game, that left BC scrambling. We didn't want to buy an expensive home game. We didn't want to travel. We didn't want to face a traditional power. So after not being able to find a lower-level FBS school, we were forced to look to FCS again. With some of our other FCS games, you can spin the matchup as a regional rivalry or traditional opponent. This isn't. Howard won't sell any tickets and won't bring any juice. This is a glorified scrimmage. But if that is what Addazio thinks we need to build the program, let him do his thing. Playing two FCSs also makes bowl eligibility that much more difficult. We now have to win seven regular season games. On the surface, the toughest stretch is at Clemson, at Louisville and then playing VT at home on Halloween. BC needs to get win one of those. A three-game losing streak going into the final month could be a huge momentum killer. I think BC fans have accepted the idea of an annual Friday game. However, hosting the most exciting opponent on a Friday upset some ticket holders. There is not much BC can do on this front. Per contract BC hosts a Friday game every year. Also per contract, every ACC team has to play a certain number of Friday games over the life of our ESPN TV deal. It was just a matter of time before the 'Noles were slotted for one of our Friday games. Ideally the Friday game would always be Labor Day Weekend or the Friday after Thanksgiving. That will happen soon, but for now this is just part of the new reality of college football. For those who did not hear the mention on the radio broadcast or missed it on Twitter, Tatyana Abrams died after her long battle with AML and the side effects of her treatment. Tatyana was the daughter of BC Hall of Famer and radio analyst Danya Abrams. The BC community was very supportive of Tatyana, including many Eagles who tested their bone marrow when the family was looking for a match. Our thoughts and prayers go out to Danya, Deanna and their sons. Is loss to Louisville a "Tipping Point loss"? -- Christian's Defensive adjustments. It is too early to consider him some sort of defensive guru but I thought Christian did a good job with the defensive calls. We used zone well and rebounded well considering Clifford's limited minutes. -- Needing more from Hanlan. If BC is going to break through, we need Hanlan to play better. His shots weren't falling, but that wasn't the problem. His defensive concentration down the stretch stunk. -- Heckmann coming into his own? Here was another game where he played well without making any glaring mistakes. I don't know if he's more focused on not trying to do too much, but he made some smart plays. We all had expectations for the season and a few players we thought might shine. However, I doubt any of us predicted the impact these three guys would have. Here are the biggest surprises of the 2014 season. When he committed, Alston seemed like a nice player to round out the recruiting class. He showed good speed and smarts, but didn't project to a true position in college (mostly because of his size). Here was a New Jersey player that Rutgers didn't recruit. Yet as soon as he got on campus, the rumblings began. Addazio and his staff realized they had something. They just didn't know what he was. And with that they did what ever they could with him, using him on punt returns. as a WR and most effectively as a Split End getting the ball on jet sweeps. Alston proved most effective when he got a little bit of daylight. Once he got some space, he could use his speed and elusiveness to turn little plays into big ones. His breakout game was USC, but he drew attention anytime he got on the field. In fact a common complaint as the season wore on was that we were using him too often as a decoy instead of getting him the ball. Other players had bigger years, but Alston was the biggest bonus since so little was expected. In August did you expect Justin Simmon to lead the team in tackles? The junior had a nice career prior to this season, but nothing to indicate that he would make such a huge jump in productivity. Simmons wasn't just a pile jumper getting lots of tackles. He saved the Wake game with a critical INT and also got to the QB when asked to blitz. Simmons also showed versatility as he split his time between corner and safety. He wasn't our best defensive player, but he was the guy who made the leap during a crucial transition season. An after thought who had never started a game, Kramer was thrust into the spotlight when Harris Williams went down against UMass. It seemed like our Offensive Line might crack, but Kramer played well against UMass and then followed the solid play throughout September. He might not have been as consistent as some of the other starters and had some tough games later in the season, but overall Kramer played well and much better than most of us would have expected. The Women's Hockey team cannot be stopped. Monday they took down Princeton. With the snow storm brewing, the stands were basically empty. Let's hope as the unbeaten streak continues, fans start to rally around the team. ESPN thinks we need to improve our WR play in 2015. Even with a new offensive coordinator and some new talent, I don't see us every becoming pass happy. Jim Christian and staff are pursuing German prospect Lukas Meisner . He would bring some much needed size to the 2015 recruiting class. At this point Christian can be selective with the class and only add players he really wants. I still expect a transfer or two to help fill out the roster next year. -- Defense keeps getting better. Georgia Tech is a terrible offense and a bad team, but BC still looked better on D. They switched well. They helped well. Magarity shot out on pick and rolls and still recovered. It gives me hope once we get more talent. -- Hanlan's shooting. He improved from the line and made some killer 3s. Let's hope his slump is over. -- Playing through bad spots. BC couldn't make a basket early and allowed a 7-0 run late in the second half, yet held on. Holding on and fighting through those moments are critical as Christian tries to build a program and change the attitude. BC needed a hat trick from Ryan Fitzpatrick Fitzgerald to beat UConn. The NHL added Johnny Gaudreau to the All-Star game. Of course in Ohio they are making Johnny Football to Johnny Hockey comparisons. The Women's Hockey team remains unbeaten. Women's Basketball lost to Pitt. I appreciate BC trying to get hockey hightlights into the Top 10. @bcinterruption We need @steveloganshow Best OC I ever had. There are a few different ways Addazio can go with this new opportunity. He can promote from within and backfill the staff opening with hundreds of names. He can hire a first-time OC (like he did when he hired Day at Temple). Or he can hire a current OC who wants to come to BC. Most of Addazio's hires at Temple and BC have either worked with him in the past or had specific ties to the region or school. I expect this hire will follow that same pattern. The Eagles hired Ryan Day as their new QB coach where he will be reunited with Chip Kelly. This is a great move for Day and a critical turning point for Addazio. 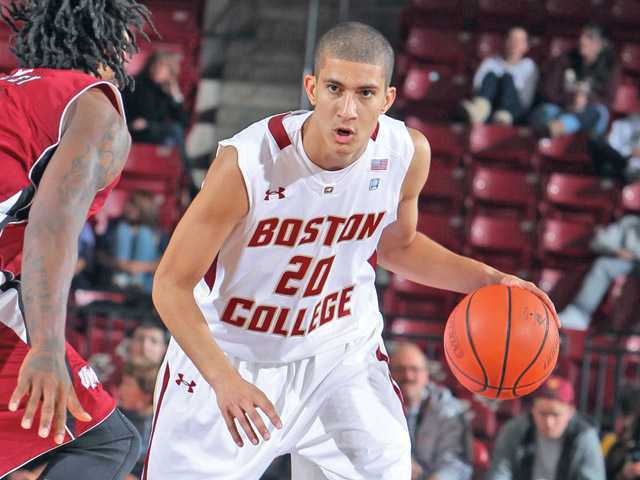 Although Day spent most of his career at BC, he's been considered a rising star by many outside of Boston. In fact, I would say he was probably under appreciated by casual BC fans. Just look at most of the comments during his stint as OC. I liked Day from the start and appreciated his role in the Jags days as well as his contributions to the offense the past two years. He got a raw deal under Spaz and then hooked up with Addazio at Temple. Having Day as part of Daz's transition also helped the new regime since Day was so familiar with much of the roster. Our offense under Day was a good blend of Addazio's philosophy as well as Kelly's innovations all while adapting to unique rosters. The timing on these things is never good, but now Addazio has to close out his recruiting class without one of his best recruiters and find a new play caller. The most obvious internal candidate is WR Coach Todd Fitch. He has playing calling experience and could run the same offense. But Addazio doesn't necessarily have to settle on an internal hire. There are plenty of guys who would want to come to BC, especially given the association with an Urban Meyer power-run offense. Being an offensive guy, Addazio will always have influence on the schemes too. I expect we will still be run heavy with spread principles. Whenever Addazio leaves BC, Ryan Day will be a candidate to replace him. This move to Philly only makes his candidacy better. It gives him NFL experience and some distance from BC. Now if Addazio struggles, Day won't be associated with those struggles. If Addazio succeeds and moves on, Day can also position himself as the candidate who can keep the best parts of Daz plus bring his unique perspective. I wish Day the best of luck and hope Daz makes a great hire. In a midweek battle, the Hockey team held off Merrimack 2-1. Stephen Gionta is sidelined with an injury, but is still getting attention from his hometown paper. A new kicker is on the way. I will have more on him Thursday. -- Batten was all over the place. Overall he played well. He's aggressive and high energy -- which we need. But he also made some mistakes from being a little too reckless. -- The bench let BC down. Odio made plenty of mistakes. Magarity couldn't provide much defensive help. Dragicevich finally got on the court -- presumably to make some 3s -- and didn't even attempt a shot. -- This team still seems to lack chemistry. It was only one moment -- but as BC is making its comeback, Brown drove to the basket to potentially cut the lead to 5. He also could have passed to Hanlan. He took the shot himself and missed and Hanlan didn't even attempt a rebound. I don't know if it was one bad moment between two key players or a glimpse into a bigger problem. Either way it was a horrible possession late in a game. Neither guy looked good. Both looked selfish. These sorts of chemistry issues are why I am giving Christian a lot of leeway this season. It wasn't a great game, but it wasn't terrible. Even though we keep losing, I am actually growing to appreciate some of Christian's adjustments. We are playing better basketball. We just don't have the right pieces right now. My association with BC and location leads to a lot of Matt Ryan talk. People are not overly critical, but I still hear plenty of back-handed compliments and unfair comparisons...and of course plenty on the "elite" debate. What's interesting is this 538 breakdown of QB consistency and performances since 2006 and how high Ryan rates. He's basically in a second tier with Drew Brees and behind only Brady, Rodgers and Peyton Manning. Stats don't prove everything, but I do think Ryan is better than the perception of him around Atlanta and around the country. Ryan was also added to the Pro Bowl. Predictably BC's vote against paying players is getting some media attention. I don't think that was BC's intent with any of this. BC has yet to release the schedule, but Maine continues to announce our football game with them. As a reminder, the Heights changes leadership at the end of the 1st semester. Included in all of these changes is a new Sports Editor. Michael Sullivan took over and will run the department until next winter. Be sure to follow him on Twitter and provide continued support of the Heights Sports site. They remain one of the best sources for what's going on among the players away from the field, courts and rinks. Good luck to Michael, all the Heights Sports writers and the rest of the paper. The Men's Hockey team came back down to Earth Sunday, losing to Maine 4-2. The Women's Hockey team shutout Vermont. Women's Basketball lost to Syracuse. “Boston College is concerned with continuing to pass legislation that increases expenses when the vast majority of schools are already institutionally subsidized. The consequence of such legislation could ultimately hurt student-athletes if / when programs are cut. I still think BC will end up doing what every other school does. The Power 5 moved closer to paying players. All the schools are for the effort -- except one: BC. We were the only Power 5 to vote against the stipend. Clearly BC knew the initiative would pass. So I have no problem filing a protest vote. Paying players will pass and BC will pay players too. I am not sure why BC felt the need to vote against this. Maybe they wanted to make a statement too our own fans. We're the only people who really care about the BC vote anyway. -- BC played solid D for most of the game. We are not Virginia but it is getting better. I also liked the Christian used different looks. Some 2-3 zone. A lot of man with switching. Even a 2-2-1 press. The only real problem comes when Clifford gets sucked away from the basket. We got beat on a few pick and rolls and a few backdoors. -- The Perpiglia minutes have to end. This has been a theme on the BC message boards for a while. I've avowed it as to not pick on the kid. However, it is killing us. The team was -4 when he was on the court and it added fuel to Virginia's run. BC never got it close after Hanlan returned. There has got to be a better rotation that still gives Hanlan time to rest. -- Heckmann played well. I kill him when he looks terrible, so I need to credit him when things go well. He cooled off, but for one stretch, he was red hot. Even his D was better. BC missed too many close shots to win, but it was a good effort. We will pull off a win against one of the top ACC teams soon. Congrats to the Hockey team for beating those guys from down Comm Ave. It was the Freshman who made the difference Friday night. The next test for the streak is Sunday at Maine. Years ago when I produced a similar season in review series, people felt I was overly harsh when I named specific players who didn't meet expectations. To avoid that, I will start this series with the biggest disappointments and select moments or groups that brought the season down. There isn't much to add at this point about our inability to convert an extra point or short field goal. Blame is shared all around. I've followed BC long enough to remember numerous kicking issues -- whether it be kickers getting kicked off the team or guys who got the yips. In every case I felt the program worked around it better than this season. There wasn't anyone else on campus that they could have tried? Statistically our Defense was better in 2014, but that doesn't always tell the whole story. We were better stopping the run and controlling the clock this year so teams were forced to pass more on us (as a percentage of their overall offense). Yet opponents attempted the same amount of passes in both seasons: 423. Yet sacks fell from 36 to 33. Do you explain away the step back just to losing KPL and Edebali? I hoped in our second season in this scheme the pressures and sacks would go up, not down. Where was the break out year from one of the young LB or Linemen? To become more than just a statistically good D, we need to start dominating. That's only going to happen when we increase the pressure on the opposing QB. All the other losses can be rationalized away. The Pitt game cannot. As Pitt struggled down the stretch, it only made the loss seem that much worse. How could a team that is focused on stopping the run have tackled so poorly? How could they come out so flat against a ACC opponent? In the long-term, the loss didn't keep BC from reaching a major bowl, but it was still the first time under Daz, where I felt the team came out flat. -- Improvement in atmosphere. Based on the ESPN3 feed it felt like the Conte crowd was into the game. Some of it was surely Harvard fans, but having the students back in campus also helped. Conte is not going to become Cameroon Indoor any time soon, but I think support and noise will energize the team and create some momentum. -- Terrible Free Throws again. This wouldn't have gone to OT or even been close if BC improved its foul shooting. There are ways to improve it (see UConn under Ollie). Let's hope Christian tries something new. -- Better Defense from Clifford. Earlier in the year he was coming to far out on pick and rolls and had trouble recovering. Now he's moving much better (although he was slow in OT). This will help our overall D.
Things don't get easier with UVA on the way, but at least we can now focus on ACC teams instead of Ivies. The first public inkling that Gene might fire Al Skinner came after a loss to Harvard. Donahue reached one of his lowest points in a loss to Harvard. Wednesday night is Jim Christian's first shot at our Ivy League nemesis. The game means nothing in terms of ACC play, but it is very important for Jim Christian with regards to setting expectations going forward. Despite their respectable record, this Harvard team is not as good as some of their more recent squads. The Crimson are favored but we have the talent to hang with them. Once again Hanlan will be the best player on the court and we have enough size to give them trouble at other positions. Winning this game would snap the losing streak and show that Christian's guys are still on board and still competing. It would also begin to change perception locally among BC fans and casual basketball fans. Harvard had a nice run, but now BC is getting things back in order. Where are the 5th Year transfers? 5th Year Transfers have been critical to Steve Addazio's first two season at BC. With practices for next season only weeks away, it looks like incoming 5th Years won't be as impactful as they were during Addazio's first two campaigns. Currently there are no signs of any 5th Years transfers enrolled. Classes started this week and four freshmen are now enrolled and will be able to practice this spring. Any potential 5th Year could still join the spring practice as long as they enroll in BC before the add/drop period. Even though they have degrees from other universities, potential new players still need to be active and enrolled at BC to be eligible. If no one pops up in the next week or two that doesn't mean BC won't use 5th years again this season. There will be another batch of players available in May (upon completion of their undergraduate degrees) and a few more who will be ready after a session of summer school. If Addazio comes up empty on transfers, I still expect him to use nearly every scholarship available. If transfers don't come through that could mean one more potential under the radar recruit or rewarding a borderline case for a 5th year among current BC seniors. The 5th year policy has been a great resource for Addazio to plug holes and add depth to the roster he inherited. As the team transitions to his players, he might not feel as compelled to find these extra guys. But I still think something will pop before the season starts. It is just a matter of when. There have been message board rumors for a few weeks now that BC Special Teams Coach Sean McGowan was out. Although still no official word from BC, Coleman Hutzler's recent Twitter activities seem to indicate he's taking McGowan's place as Special Teams Coach. On the surface it might seem like BC made the change due to our kicking woes. It's not. This is more about recruiting and fighting complacency. As much as we assign blame to coordinators or position coaches when things go wrong, football remains a very collaborative effort. The inability to make an extra point does fall on Sean McGowan because he was assigned Special Teams, but it also falls on Addazio. They knew they had a problem months ago and never found the right solution. Our other areas of Specials Teams were decent. We had good return games and an improving coverage team. But once again, Special Teams is still very dependent on how much time Addazio allots to it and who he assigns to play on Special Teams. That's why at many programs the Special Teams coach has another assignment. And if a guy is just Special Teams, he better be an ace recruiters. Based on his age and his short track record at Stanford, New Mexico and Florida, Hutzler fits the recruiter mode. While I think keeping a staff intact is important in College Football, there is a fine line. A good program needs new blood, new ideas and needs to fight complacency. BC is coming off two winning seasons but there is still plenty of room for improvement. Recruiting is going well, but we still need more and better talent. Recruiting is very dependent on young staffers. They tend to have the energy needed for the constant travel, calls and texting. They also tend to relate better to the younger kids. This current staff's age/experience was offset by Addazio's energy and willingness to recruit. But considering he was still one of the younger coaches, McGowan was not making an obvious impact on recruiting (based on the credit given from the recruiting sites nor on Social Media). If McGowan wasn't meeting expectations as a recruiter, than Daz needed to make a change. It may seem harsh but it also sends a message to the rest of the staff. BC needs to keep getting better and guys need to keep grinding. From what I've been told, the staff likes Daz, but he works them hard and expects a lot. Hutzler is a welcome addition. He'll hopefully kick recruiting into the next level and get the real kicking on track. Unless there is a retirement coming, I think this might be it on staff changes for now. While not an easy decision -- like many of Addazio's program moves -- this seems like the right thing to do. After a tie on Friday night against Northeastern, BC rallied to beat the Huskies 4-2 Saturday. They are unbeaten in their last seven. The Women's Basketball team had a rough day in a lopsided loss to Notre Dame. This is from last week, but Football Study Hall put together some stats from the Pinstripe Bowl. The advanced stats state that Penn State should have won comfortably. The Heights took a look at BC's potential role in Boston's Olympic bid. -- Odio came to play. Maybe it was being back home or maybe he's finally healthy, but Odio had a good game. He made three critical 3s. His help D was ok, but he still has trouble with guys away from the basket. He was certainly an improvement over Heckmann. -- Missing FTs cost BC the game. Hanlan and Clifford both missed crucial tries late. That's mental. Hopefully more of those will fall in soon. -- The Defensive schemes are solid. BC had real trouble with Jekiri's strength and size, but overall the defense was good. There weren't as many open looks for Miami and we are still not athletic, but they are getting better on D. That is another long-term sign that things are headed in the right direction. Next up is Harvard. It's not an ACC game, but it is very important as a program building game. If you like wonky football Xs & Os and the evolution of an offense, read this Grantland piece on Urban Meyer's incorporation of Oregon schemes into his offense. Due to Addazio's ties to Meyer's power/spread/option work at Florida and Ryan Day's ties to the Chip Kelly/Oregon tempo/spread, there are elements of both styles in BC's offense. However, the Addazio/Day hybrid has been very different from both (so far). As Grantland pointed out, Meyer still uses power, but also added much more zone blocking schemes and attacks the defense outside the tackles. Since leaving Florida and partnering with Day, Addazio has doubled down on power. We between the tackles all the time and even when we throw in a jet sweep to Alston, it still has power elements. BC also runs more than Oregon or Ohio State. The only programs that run more than BC tend to be teams that run variants of the triple option. But how much of what BC does is by design and how much is necessity? Addazio didn't inherit a roster like Meyer's or spend the past decade recruiting speedsters like Oregon. Other than the power football, the only hallmark of Addazio's first two years is his ability to adapt his offense to the talent available. He's not stubbornly trying to shove a square peg into a round hole. I expect BC's offense to continue to evolve. Will they follow Meyer's path or will they incorporate Kelly in different ways? It will be interesting to see. But at least Addazio and Day's peers and role models are showing that you have to keep adapting and changing. Hopefully their adaptations lead BC to a championship game like it did for Urban Meyer. I am already stuck in traffic for the 2024 Boston Olympics. http://t.co/9pTi3MrDPu Coach OB did an outstanding job at BC. He built a program that I was really proud of. Thanks, Coach! New Year's Day was different this year. The games had more meaning because of the new Playoff. One thing that wasn't different: no BC. As great as the Pinstripe Bowl experience was, BC still wasn't in a major bowl. And BC hasn't played in a true major bowl since the Cotton in 1985. As much as we want to blame it on travel reputation and fanbase size, there have been automatic qualifying opportunities for more than 20 years. First the Bowl Coalition, followed by the Bowl Alliance, then the BCS and now the Playoff. As a member of the Big East and the ACC, BC had access to all of these games. We just never played our way into any of them. We know the near misses: losing to WVU in '93, losing to Syracuse in '04 and dropping back-to-back ACC Championship Games. At this point it is almost bad luck. Other Power 5 teams have made it on fewer close calls. Of course the ACC would have the most teams that have not played in a major bowl. Despite that fact, I don't worry that we are locked into some top heavy conference that will never enable a major bowl. As Georgia Tech showed this year, there will be many times when the ACC runner up also makes a major bowl (as long as the winner gets into the Playoff). As daunting as Florida State, Clemson and Louisville may seem right now, it only takes one down cycle for things to change. The variety and number of schools that have made major bowls should be encouraging to BC fans. It shows that things can change quickly and every school will get its shot. I'm impatient for our shot, but believe it will be here soon. And hopefully by that time there are eight teams in the playoffs...because then we have a chance to win the whole thing. Women's Hockey kept their unbeaten streak alive by defeating BU 4-3 Wednesday. The streak is now 19 games. The team will try to make it 20 this weekend against Northeastern. Former BC Captain Russ Joyner died last week. He was a key part of the early Bicknell years and then went on to a short career in the NFL. There will be a memorial at BC this weekend. TOB made the media rounds Wednesday with regard to his retirement. I found it interesting that he mentioned Boise as the most satisfying game. It wouldn't have been the game I picked but it did have significance. Baseball released its schedule. I think the goal of the season should be to at least get to .500 in ACC games. In the "what could have been" file, new Hall of Famer Craig Biggio nearly played football at BC. After Duke I still had optimism about the season. I think that's gone. BC blew a halftime lead. BC blew a 10 point lead in the final three minutes. BC blew a five point lead with a minute left in OT. It was painful throughout. There is plenty of blame to go around. -- Heckmann! I hope this loss used up his goodwill and any confidence Christian had with him. The mental errors and sloppy play are too painful to watch any more. -- Brown needs to drive more and shoot fewer 3s. It will be better for everyone. -- Hanlan's shots weren't falling but he was the least of our problems. I liked him finding Owens cutting to the hoop. -- Clifford is moving better. Now we just need him to stop making Donahue plays (bad D and bad passing). Just have him stay close to the basket. The further he gets away from the hoop, the less effective he is. I don't know enough about Christian to know how he will adjust or how the players will react. I want them to be better but who knows what they can really be. Grantland featured former Eagle Alejandro Bedoya Tuesday and wrote that he is model for U.S. Soccer and reinforces Jürgen Klinsmann's desire to have his players playing in Europe's best leagues and not MLS. The BC-connection to it all was that Bedoya elected to play in Sweden after finishing up at BC because of another Eagle Charlie Davies. His friend prepared him for the social issues that Bedoya would face in Europe but also explained how it would sharpen his game. Leaning on alumni friends for career advice happens all the time among BC folks even if your office is a Soccer Pitch in Sweden. Lonnie Jackson was one of the first Donahue holdovers to impress Jim Christian and the new staff. Aside from the weight they wanted him to put on, he was poised to be a contributor and leader of the new team. An injury derailed that. He missed the beginning of the season and after a few brief appearances will miss the remainder of the season with the same leg injury. While unfortunate for this season, this is not terrible news for Jackson or Jim Christian's rebuild. Jackson will apply and should be granted a medical redshirt. That gives him one more year of eligibility and helps correct the major roster imbalance that BC still faces. With Jackson returning, he and Dennis Clifford would serve as the senior leaders of next year's team. If Hanlan returns and they pick up a few more transfers, BC would have an experienced roster and some versatility among its seniors. The extra year also gives Jackson a chance to bulk up. The new staff liked him a lot and felt his frame was the only real drawback to him seeing lots of minutes. Jackson is a role player. He could have helped this year, but not enough for BC to be a tournament team. Coming back next year, healthy and ready to play could ease Christian's transition and help BC avoid the bottoming out that usually occurs with mega classes and coaching turnover. The Hockey team defeated Dartmouth -- in Dartmouth's own tournament -- to win the Ledyard Classic. Andy Gallik accepted an invitation to the Senior Bowl. He is probably BC's best chance of having a player drafted this year. Future Eagle Michael Walker was a Finalist for Offensive Player of the Year in his region in Florida. For those who missed it, here is the obituary for former Eagle Clarence Cannon. Women's Basketball lost to Miami. -- I thought Magarity and Clifford played well defensively against Okafor. It was only after they both got in foul trouble that the game got away from BC. It didn't determine the final outcome, but the foul on the Clifford elbow was pretty lame. It was clear from the later replays that it wasn't intentional and that Okafor walked into it. -- We need Batten and Brown to play well if we are going to pull off any upsets. I've been impressed with both this season and loved Batten's attitude, but both left their shots in Chestnut Hill. If they are off, we don't have enough other scorers to win big games. -- Hanlan did mostly what we thought he could do. He didn't dominate the game, but he still made some great baskets. In our half court offense he needs to be a little more careful with the ball and clock, but this was an encouraging start to ACC play for our best player. We now have to regroup for the Pitt game. That is home and winnable and should tell us a lot about the team. Florida State got hammered but it was still a good day for college football and BC. For starters the SEC lost. They will always have talent and money advantages but the favoritism of the old BCS format is gone. It is no longer 12 teams playing for one spot in the final and the other 112 teams playing for the other. This postseason brought the SEC down to earth and that perception will help in future selection committee meetings. The second thing that helped BC is people already wanting eight teams in the playoff. The closer we get to that the more likely BC gets in. One other thought: for all our offensive ties to Oregon and Ohio State, our offense doesn't look much like either program. It will be interesting to see how we evolve when Addazio gets the type of talent he prefers. BC fans should be rooting for Florida State this postseason. Not because we feel for Jameis Winston or think Jimbo Fisher is a good guy. The reason to cheer for the defending champs is pretty pragmatic. A win for the Noles is good for the ACC and good for BC. Fans have been cheering on foes in various scenarios for decades. However, the SEC took it to a new level during the BCS era. They celebrated their conference success as a form of validation for their own teams. And it worked. Just look at all the positive attention the SEC West teams got this year just for playing each other. The media and more importantly the BCS voters and now the selection committee bought it. If Florida State repeats it helps BC. It brings more money, helps recruiting and makes our close losses to the Noles look more impressive. I don't get any real satisfaction when ACC teams win. I don't live vicariously through those teams. I want BC in those championships and winning those games. That obviously won't happen thus year. So the next best thing is improving our team and that only happens this postseason is if the ACC and FSU come out on top.